My father remembers that when I first arrived, he’d wake up to me calling out “Abojee! Abojee!” in the middle of the night, the Korean word for father. As a little girl, those nights in my new home in America were filled with the angst that if I fell asleep at night, I might wake up utterly alone. I fought against the tide of sleep until I was secure in the knowledge that one of my parents would still be at my side. I remember that my mother, after running out of lullabies, would often sing me to sleep with Christmas carols. I was around two years old when I was adopted. 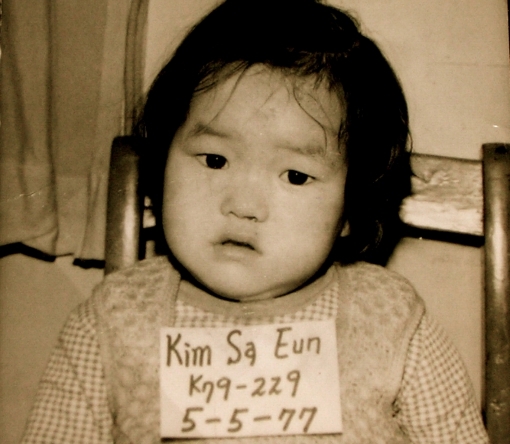 I say ‘around’ because my date of birth and name on my official adoption documents were most likely fabricated in 1979 by social workers at the White Lily orphanage in Daegu, South Korea. On those papers, it says that I was “abandoned,” without explanation, nor with the names of my biological parents. For many Korean adoptees, this is the norm. Many of us will never know our real stories because those early erasures of our original families were not only commonplace but were created to make us into social orphans, a profitable industry. Many of us were the children of unwed mothers who faced the stigma of raising us alone and unsupported by the state. Caught in precarious social and economic circumstances, their only option was to relinquish their children to wealthy, white and European parents who could provide “a better life” with the promise of a home, education, and cultural capital. I feel compelled to return to this giant chimera of adoption because it continues to haunt me. Equivalent to a giant elephant in the room, the chimera represents everything that is unspeakable and messy and ambivalent. Like many Korean adoptees, I grew up in a liberal, white family, in a predominantly white town, and came of age during the years of neoliberal multiculturalism in the 1980s and 1990s. I didn’t realize it then, but my discomfort as a hypervisible minority in my family was the direct result of being raised in a climate of colorblind attitudes when international adoption was part of a continuing trend of the white American savior complex. I was taught to believe race wasn’t important, when the real reason was that nobody knew how to discuss racism and micro aggressions, especially the social workers at adoption agencies. “Tell people you’re American,” my well-meaning parents advised me, never anticipating the routine question that followed, “but where are you really from?” which pointed to my perpetual foreignness within my own family. Because they had never been seen as anything other than American, they assumed that no one would question me. In public, I didn’t pass as a fellow “American,” but always as a hyphenated other, most often mistaken for Chinese or Japanese. Unconsciously, I internalized my Koreanness as shameful and inferior even though I never vocalized my self-hatred. Similar to the little girl Peccola in Morrison’s novel The Bluest Eye, I too secretly desired big, blue eyes and blonde hair that were illusory markers of beauty and happiness: white was beautiful and desirable. At any other moment in time, I would have had the wherewithal to defend my use of “white people.” But my code-switching had gotten stuck shifting gears between my usual, casual language while among friends in L.A. and my more monitored, politically-correct language. To them, being lumped together as a non-discriminant group of “white” people was not just pejorative, but insulting. But why was “white people” offensive to my family? Was it because their race was suddenly spoken of by me as a marker of division, the only non-white person in the room? Suddenly, I am pointing out explicitly that their skin color is no longer invisible, but is a marker of privilege. They rarely have to confront their own skin color on a daily basis, or experience unconscious bias from others because they are considered good, moral people based on their inherited status of white privilege which they never had to earn, but was simply given. I do not blame them, nor feel resentment for this immutable fact of birth and biology, but because it has existed as a silent, looming elephant in the room, I wish that these conversations were not one-sided, with me scapegoated as the “angry” or “ungrateful”adoptee or person of color on a pulpit. I feel it necessary to point out that writing about my family makes me fearful that it will be perceived as criticism of them, when in fact, it is motivated by a fierce love. Dialogues of racial difference in transracial, interracial and mixed-race families, become so freighted with emotion, fear, ignorance and denial that often precludes honesty. Ultimately, what is the correct and empathetic way to enter into a dialogue that would elicit deeper understanding and not unravel into hurt feelings and misunderstanding? When I returned to L.A. and talked nonchalantly with friends and acquaintances about this incident, most of them were surprised that “white people” could be considered a slur. In California, everyone is used to saying “white” the way “Asian” and “Black” are used as references to race, not as derogatory labels. Since then, I have replayed the Christmas incident in my mind, imagining what would have occurred had I explained my use of “white people” as inoffensive. I know that our history of disagreements over race and colorblindness would have prevented a rational discussion from ensuing. I realized my mother’s correction of my language triggered a deeper insecurity and unspeakability about our racial difference and by extension, our biological estrangement, our otherness from each other that could not be bridged. My brother’s causal comments about ethnic food in front of me is his own way of broaching race because my Asianness is uncomfortable and perhaps illegible to him. My father’s absolute silence about the subject is his way of remaining neutral, and thus safe. I wouldn’t call it outright denial, exactly, because I love my father in the loyal way that a daughter does, and I cannot judge him without blaming myself. I cannot speak for other adoptees, but I know that adoption has shaped everything about the way our family interacts, speaks, and doesn’t speak about things. It affects the way I view family as a paradoxical source of warmth and protection, but also as an anxious entity that could disappear at any moment. with each experience that has brought me closer to having a family of my own, my feelings have changed , to the point of considering what kind of mother I will be one day. And if I choose not to have children, I won’t feel a loss the way I would have felt in my twenties. As another year begins to unfold, I think about how notions of love and kinship ultimately force us to be more forgiving of ourselves, and forgiving of the ones who choose to love us back. My family and I have gone through the fire, so to speak, and come out a stronger, hell-bent iron that has been stranger than fiction. Nicky Sa-eun Schildkraut is a poet, scholar and teacher in Los Angeles. She holds an MFA in poetry from the University of Florida and a PhD in Literature & Creative Writing from the University of Southern California. Her first book of poetry, Magnetic Refrain, was published in 2013 by Kaya Press and she is currently working on a second book of autobiographical, critical essays entitled Vaguely Asian: Being In-Between As A Korean Adoptee, and a literary novel, Missing Persons.